Metal detecting is a great hobby and there have been plenty of treasure hunting success stories. Amateur treasure hunters don’t have to buy expensive metal detectors to enjoy hunting for buried treasure, but they do need to buy a reliable and powerful metal detector. The market is flooded with cheap field detection kits, but some of them are just not worth the money. The Garrett EuroACE detector is an interesting piece of equipment that has been especially designed for treasure hunters who like to scour rugged terrain. So, let’s talk about the detector as a whole and discuss why it has become so popular with the relic hunting fraternity. * Enhanced Iron Resolution – Allows more control of iron discrimination levels. * The Detector comes standard fitted with a large PROformance Double-D search coil. * An Improved Audio Tone helps distinguish between ferrous and non-ferrous targets. * The EuroAce Package comes with a set of Garrett ‘Easy-stow’ Headphones. OK. All of this information sounds fine, but keen gold prospectors need metal detectors that are easy to operate. Good news travels fast in the metal detecting world, and many treasure hunters report that this lightweight, metal detector is a great workhorse with a water proof search coil. The controls on the keypad are easy to understand and the settings are easy to change. Treasure hunters want to spend their spare time hunting for treasure, they don’t want to spend hours trying to figure out how to set the detector keypad. * The three main settings include: Mode, Sensitivity, and Discrimination. * Located on the left-hand side of the keypad you see a list of treasure you can search for. The Modes Include Jewellery, Custom, Relics, Coins and Zero. * On the right-hand side of the metal detector keypad you see a coin detection depth, the depths range from 5cm to 20 plus cm. From a metal detectors point of view these controls are pretty self-explanatory and that is a big plus for the new detectorist. The Garrett EuroACE is a powerful metal detector that can be utilized by amateur’s and professional’s alike. Set the controls to zero and the EuroAce will beep as soon as it hovers over any type of buried metal. Change the keypad setting to detect coins and the detector will only beep when it passes over coins. Use the custom setting and you can create your own personal search terms. The EuroACE will store your custom search for future reference, but the detector will return to factory settings when you use all other modes. This clever metal detector has the ability to pick-up on the smallest coins and relics. 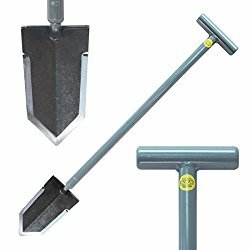 The Garrett EuroAce performs well in all types of soil and over all, as metal detectors go, it has to be one of the best in it’s category on the market. To Learn More About the EuroAce metal detector or other metal detecting products in the United Kingdom, check out Crawford’s Metal Detecting. The UK‘s Premier Metal Detector Dealer. This entry was posted in Metal Detecting, Metal Detector Reviews and tagged Garrett EuroAce, Garrett EuroAce Metal Detector, metal detecting articles, metal detecting blog, metal detector, treasure. Bookmark the permalink. Sounds a great machine, I’ve used the Ace 250 and was so impressed by it’s features and performance. The EuroAce is a superb step forward for these detectors. Another nice one from Garrett!